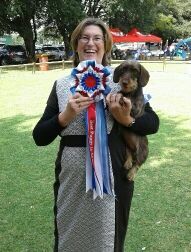 Clearview dachshunds is run by Sarah Rose with the invaluable help of her husband Charlie. We are situated near Henley on Klip, Gauteng, South Africa, on a small farm at the foot of the Suikerbosrand hills. 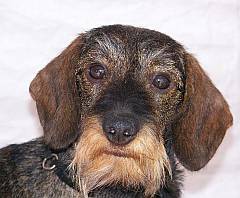 We strive to breed quality mini wire haired dachshunds with the best of temperaments. To achieve this we have imported Eastriding Zino of Clearview from the UK who has started producing excellent, kind natured puppies. Recently, two more dogs have been imported to complement Zino's lines. They are Magik Rainbow Vincent van Gogh at Clearview and Elphyn Ozzie Ovation at Clearview. Vincent came from St. Petersburg, Russia from one of the top kennels in the world, and Ovation from Townsville in Australia and carries top American lines. Their temperaments are outstanding and they have both achieved Champion status here in South Africa. All our dogs are people friendly and any person interested in purchasing a puppy from us is welcome to visit us and the dogs. We don't always have puppies available but please contact us to put your name on the list. CH Eastriding Zino of Clearview (Imp UK) Colour: boar. CH Magik Rainbow Vincent van Gogh at Clearview (imp Russia) on the left having a quizzical moment with CH Elphyn Ozzie Ovation at Clearview (imp Australia). Both are red miniature wirehaired dachshunds. Above, Stonecourt Cider with Rosie at Clearview, is a good example of size. A miniature has to weigh under 5 kg for the show ring. The ideal weight is 4.5kg. 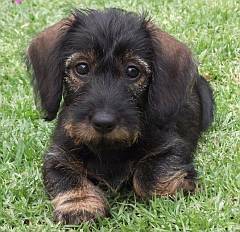 As they were bred down from standard size dachshunds, and are a relatively new breed, they often go over. So someone could have a registered dachshund that weighs up to 6kg, especially if they are fat! They are not given heights or lengths in the breed standard but she stands approx. 15cm at the shoulder and is approx. 30cm in length and weighs 4.6kg. A standard should weigh between 9 and 12 kg and is substantially bigger. This chocolate colour is very rare. All our puppies are registered with KUSA with breeding restrictions. They are innoculated, dewormed, and health checked. A microchip is implanted in the puppies before they leave my care. All owners receive their registration papers. We also fly puppies to major destinations within South Africa at cost.